Earn and save up to £500 per year with Solar PV panels.. Solar PV panels can earn and save you up to £500 per year through savings on electricity bills and Feed-in Tariff payments. With systems typically costing in the region of £3,000 to £7,000, the Energy Saving Trust recommend that you receive three quotes. EnergyLink can arrange for you to have up to 3 free surveys and quotes from accredited local Installers. This saves you time and helps to avoid rogue companies. As Installers know they are competing, you could save as much as 30% on the cost of the system. Light from the sun is converted into electricity that can be used to power lighting and other appliances in a building. In addition to large savings on electricity bills, you can also earn an additional income from the Solar PV Feed-in Tariff for a period of 20 years after installation. A domestic Solar PV system costs in the region of £3,000 to £7,000 depending on the size. Commercial systems start at £6,000. By using our price comparison service you can shop around local accredited Installers and not only compare their service but choose the best quote. How much can I earn and save? Installing Solar PV panels can save you between 30% and 50% on your electricity bills. You will also receive Feed-in Tariff (FiT) payments from an energy supplier for every unit of electricity generated, in addition to a payment for un-used electricity fed back to the grid. A domestic household can earn and save up to £500 per year through bill savings and FiT payments. The cost of the system can be recovered in around 10 years. 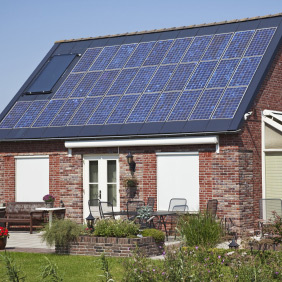 Solar PV is typically installed on a roof that faces either South East, South West or South. They can also be fitted either side of a roof that faces East & West. There must be at least 8 square metres of space which is roughly the size of two cars. There should ideally be little or no shading from other buildings, trees, etc. EnergyLink Ltd. have a network of MCS and RECC accredited Installers working across England, Scotland & Wales. After filling in our form, an advisor will check that your property is suitable and explain the potential costs and savings before passing your details to up to three Installers. They will then carry out a technical survey of your property and provide you with written quotations. My boiler is now installed what a difference it has made. My house is nice and warm and I am making savings on my bills. Very happy customer.